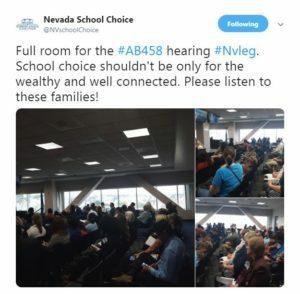 Nevada Committee Hearing for Bill #AB458 DELAYED until Thursday, April 4th at 4 p.m.
As we mentioned a few days ago, the Nevada Assembly Taxation Committee was set to hear bill #AB458 on Tuesday, April 2nd. This bill will REMOVE the 10% annual increase in dollars needed for waitlisted and new scholarships. The sponsor of the bill never showed up to present his bill and at the last minute, the Committee Chairwoman pulled the bill and said they will now hear the bill on Thursday, April 4th at 4 p.m. 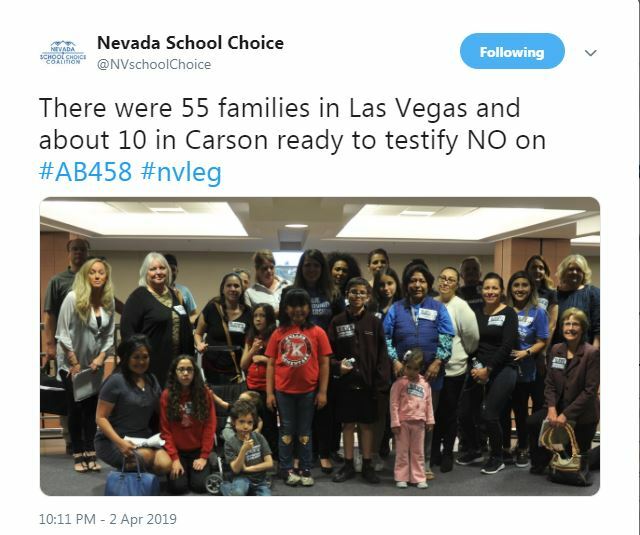 Thank you to everyone who came out to Las Vegas and Carson City to testify against the bill. We ask that you please come out again on Thursday to make sure your voices are heard! WE NEED YOUR HELP TO STOP THIS BAD BILL WHICH ENDS ANY ANNUAL INCREASE IN THE OPPORTUNITY SCHOLARSHIP PROGRAM. Please come out to the meeting on Thursday at 4 PM and tell the committee members that you OPPOSE bill #AB458. If you feel comfortable taking 1 or 2 minutes to share with the committee why your child needs this scholarship you will be able to do that too. We will have people there to meet you and give you stickers to wear. 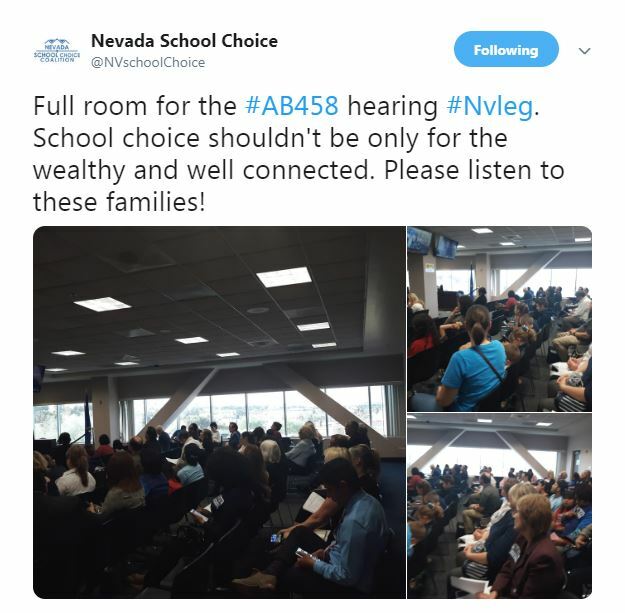 If you are attending please call or text us at 702-941-4448 so we can provide more information and connect you with an advocate at the meeting. 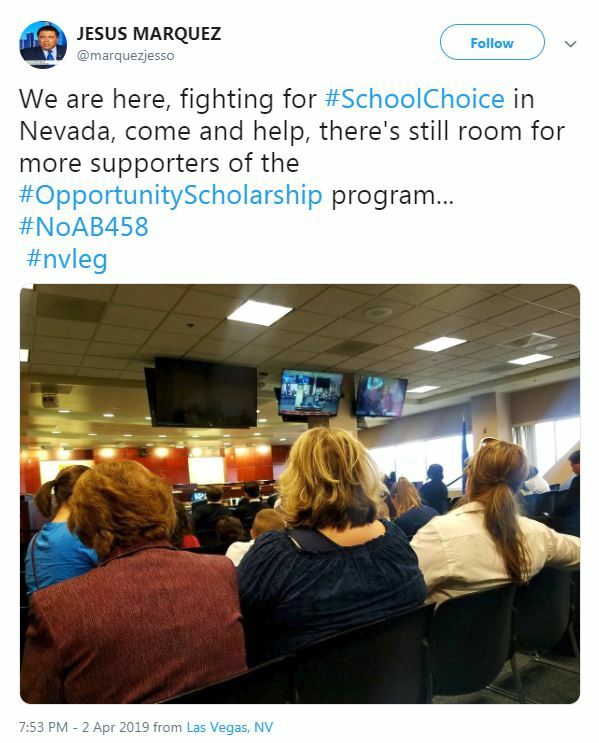 If you cannot attend in person, please call Committee Chair Assemblywoman Dina Neal at 775-684-8587, and Assemblywomen Ellen Spiegel at 775-684-8577 and let them know you OPPOSE Bill #AB 458 and state you are on the wait-list for a scholarship. In a few sentences state why your child needs this educational choice. 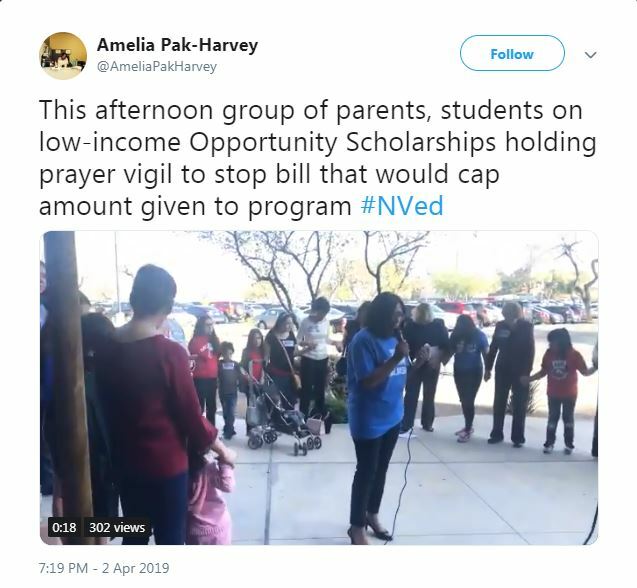 Post a comment on the bill at https://www.leg.state.nv.us/App/Opinions/80th2019/ Enter “AB458” for the bill number and check the button that you are AGAINST the bill. Then share a few sentences on why you want a scholarship. Legislators look at these posts! BILL #AB458 HAS THE POTENTIAL TO DESTROY THIS INCREDIBLE LIFE-SAVING PROGRAM AND WE MUST MAKE OUR VOICES HEARD TO CHANGE THE COMMITTEE MEMBER’S HEARTS AND MINDS. WE NEED YOUR HELP TODAY! Thank you again and we can win this fight if we all stand up for our rights! p.s. A big shout-out to everyone who came out on Tuesday, April 2, to testify against AB458. We truly appreciate your efforts! It is with great sadness that we announce the passing of our dear friend, colleague and tireless advocate for disadvantaged students, Cheryl Hillen. Cheryl began her advocacy for quality k-12 educational options for all students back in the early 1990s. Even after she was diagnosed with an aggressive form of brain cancer, she never stopped fighting to end the vicious cycle of generational poverty. As Director of Corporate Relations for AAA, Cheryl communicated the need for businesses to invest in the economically-disadvantaged communities they serve. Her work remains a critical factor in AAA’s continued success and growth. Prior to her work with AAA, Cheryl founded Project Education and served as Director of Development at the Alliance and Advocates for School Choice (2004-2008); Vice President at Children First America (2000 – 2004); Director of Development at Citizens for a Sound Economy (1990 – 2000); and Vice President at D.C.-based government relations firm, Valis Associates (1986-1990). Prior to that, she worked on political campaigns and on Capitol Hill. We re-dedicate ourselves to continuing Cheryl’s legacy. Our loss is heaven’s gain. We will forever miss her. Please read her full obituary here. The Nevada Department of Education has released its annual student achievement data report for students in the Nevada Educational Choice Scholarship Program and the results are positive overall. 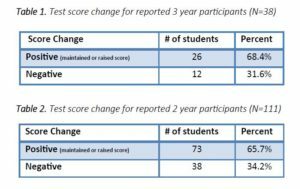 Although the number of students whose test scores could be tracked longitudinally over three years was limited because different schools may use different assessments, 68.4 percent of those that could be compared showed positive learning gains (defined as a maintained or raised score year over year). For those students whose test scores could be tracked over two years, the results were also positive overall (65.7 percent). Read the state’s full report here. 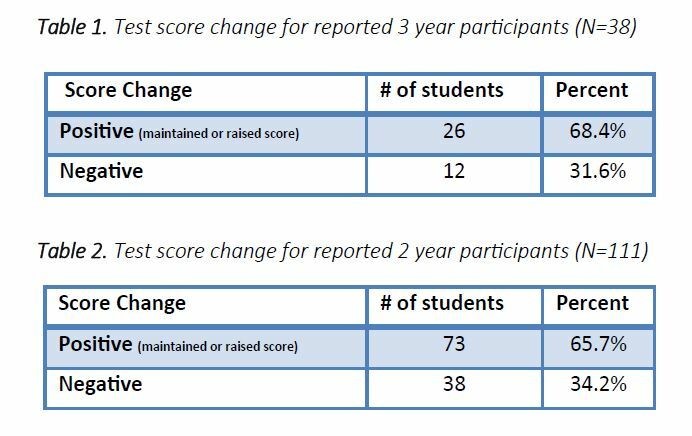 These results confirm what other studies have shown (here), the longer the time period that students participate in these scholarship programs, the more they benefit from them. AAA Scholarship Foundation is proud to be an approved Nevada Scholarship Granting Organization. For more information about the Nevada Educational Choice Scholarship Program, please visit us at www.aaascholarships.org. The update also confirmed their earlier findings that the longer a student participates in the program, the higher the likelihood that they will attend a four-year college and earn a bachelors degree when compared to their public school counterparts. The studies are unique in that the public school comparison samples were made up of students who attended the same public schools as the scholarship students (before their participation) – making the results robust. AAA Scholarship Foundation is proud to be one of only two administrators of the Florida Tax Credit Scholarship Program. To find out more about AAA or any of the six scholarship programs we administer, visit us at www.aaascholarships.org. Thais R. Sullivan has been a devoted member of Palm Beach County for over 30 years and has worked in almost every position within the banking industry. From filing checks, to serving as a lender, and everything in between. Thais’ hard work and passion to learn eventually landed her the position of Vice President, Regional CRA/Commercial Lending Officer for the State of Florida at Valley National Bank. Thais wasn’t always interested in working in the banking industry. When she was younger, she loved fashion and aspired to become a fashion designer. When Thais initially moved to Florida from Detroit, Mich., she learned that the school system did not offer the same type of fashion classes that they did up north. She ended up putting fashion on hold and decided to go in a different direction. 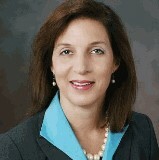 Thais attended Barry University, where she received her Bachelor of Business degree. During her time there, she worked at Barnett Bank (which is now famously known as Bank of America) during the day, and attended school at night. While she worked at Barnett Bank, Thais was assigned to an executive who generously mentored her and encouraged her to get her degree and branch out within the banking industry. Thais continued to climb the totem pole and familiarize herself in all aspects of the industry. As the years passed, she was recommended to be a CRA Officer due to her extensive lending background and exceptional customer service skills. Combining her skills and love of helping others, Thais says that the day they hired her as a CRA Officer was the day she stopped working. It no longer became a job to her, but something she knew she was meant to do. Thais’ passion for helping those around her has led to her active involvement in multiple organizations – including The Palm Beach County Sheriff’s Foundation, The Anquan Boldin Foundation, The Black Chamber of Commerce, The Boys and Girls Club of Riviera Beach and many more. Volunteering isn’t just a hobby for Thais, it is what makes her, HER! That’s why joining the AAA Scholarship Foundation and becoming a board member was a no-brainer for Thais. “It’s one more tool to add to my toolbox!” she says. Thais brings a work attitude that is second to none, which is why it is no surprise that she was recognized as one of the “Most Influential & Prominent Black Women in Business in Palm Beach County” by Legacy Palm Beach. Thais has been a friendly face to everyone she has encountered. She never shies away from an opportunity to teach others about affordable housing, or to simply inform them of the amazing shoe sale that’s currently taking place at Nordstrom. When Thais isn’t working, she likes to travel and spend time with her mom, husband and two sons. The five of them love to go bowling, and when asking Thais who the best bowler in their family is she says “Probably my husband, but of course I would never tell him that.” Your secret is safe with us, Thais. Click here for a pdf of this Spotlight. Ahsaki Hardy sits amongst many other enthusiastic parents as she watches her children, Jaylen and Savon, receive honor roll once again. She knows this wouldn’t have been possible without the financial stability provided by a scholarship from the AAA Scholarship Foundation which allowed Ahsaki to send her children to a school tailored to their learning needs. 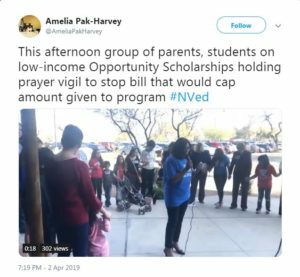 Knowing that they’d face countless obstacles, Ahsaki made the courageous decision to move her family from Massachusetts to Nevada, not really knowing what to expect. She was in desperate need of a climate change but she also wanted to move to a place that her family could eventually call home. Ahsaki worked as a family support specialist, which was the family’s only source of income. Her children’s father was unable to work due to an injury, which would later result in surgery and the family losing their secondary source of income. Ahsaki was focused on work, making sure there was food on the table and caring for her children’s father so she hadn’t really noticed how reserved Jaylen, her oldest son, was acting when he would arrive home from attending third grade at his zoned public school each day. She asked him the normal questions such as how was school, did he need any help with his homework, and so on, but he didn’t allude to anything being wrong. It wasn’t until report cards were sent home that Ahsaki learned that Jaylen’s grades were starting to drop, which was out of the ordinary for her intelligent young son. Ahsaki made it her mission to find out what, if anything, was going on at school that was causing Jaylen’s grades to suffer? After some gentle prodding, Jaylen finally broke down and confessed that an upperclassman had been picking on him. Alarmed, Ahsaki asked question after question, and learned that it had started on the school bus where Jaylen was being teased and called names, and continued into the classroom, as well as into after school care. “I don’t like this school anymore,” said Jaylen. Ahsaki was heartbroken and wanted to put a stop to the bullying immediately; however, because of their financial situation, she felt like her options were limited. That night, as she lay in bed absorbing all the information she had learned earlier that day, she knew she needed to make a change. If she didn’t pull her son out of this school now and put a stop to the harassment, who knew where it would lead? To make matters worse, her youngest son, Savon, was getting ready to start school for the very first time, and the last thing Ahsaki wanted was for him to enter that type of hostile environment. Ahsaki had heard of a few private schools in her district and decided to visit Lake Mead Christian Academy. Right away she noticed that the classroom sizes were much smaller than at Jaylen’s previous school, where he was one of 35 students in a classroom with one teacher. This school also had a tracking system, which notifies the teachers if any students are falling behind in a subject or aren’t quite grasping the concept as quickly as their peers. The teachers can then intervene early and provide those struggling students with enhanced guidance. Ahsaki admired this about the school as it showed her that the administration truly wanted their students to succeed. 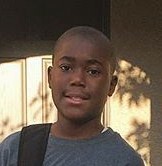 Ahsaki desperately wanted Jaylen to attend Lake Mead Christian Academy, as well as enroll Savon there so that he would not only be with his brother, but would also be protected from the bullying that Jaylen has experienced. As they approached the end of their tour, Ahsaki informed the administrator of their current financial situation and told her that she would do anything to send her children there. The administrator told her that they had a few students already benefitting from the AAA Scholarship Foundation and encouraged her to apply for a scholarship to see if her family qualified. To her relief, they did! Now in the seventh grade, Jaylen genuinely loves going to school and expanding his academic horizons. He takes advantage of every activity the school has to offer, including basketball, choir and even Speech Meet, which is a spelling bee-type competition with a twist – students can pick a speech, poem or passage from a book to deliver. Students do not compete against each other, rather, they are judged on how well they deliver their selection. This practice helps students develop techniques to speak audibly, confidently and expressively – crucial skills they will need for their day-to-day lives. 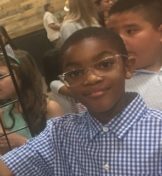 As for Savon, he is now in the third grade and is passionate about reading and participating in the school’s theatre program, where he landed the lead role in The Little Engine That Could. The AAA Scholarship Foundation awards scholarships solely to qualifying low-income, disabled and/or displaced students. The typical AAA Scholarship student is an ethnic minority living with a struggling single parent/caregiver in a high crime community. More than 85 percent of AAA scholarships are distributed to children at or below 185 percent of poverty. Many children are either below grade level, failing at their previous school or both when they receive a scholarship. Parents, who find their children in these circumstances and are concerned about their future, look for viable options. They seek an atmosphere that challenges their child and will reverse inadequate learning, social patterns and the potential lifelong negative impact. They wish to change their child’s learning environment, acquaintances and the unfortunate predictable outcomes associated with school failure. AAA Scholarships are funded in Arizona, Florida, Georgia and Nevada by corporations that redirect a portion of their state tax liability to the AAA Scholarship Foundation in exchange for a dollar-for-dollar tax credit. The AAA Scholarship Foundation is one of the only approved 501(c)(3) nonprofit scholarship organizations exclusively serving qualifying low-income, disabled and/or displaced students through these tax credit scholarship programs in multiple states. AAA Scholarship Foundation provides your company with the convenience and efficiency of a single-solution for participating in multiple state tax credit scholarship programs. For more information, or to learn how your corporation can participate in the program, visit www.AAAScholarships.org, or contact Kerri Vaughan at kerri@aaascholarships.org or 888 707-2465 ext. 730. For a pdf of this spotlight, click here. Growing up right outside of Philadelphia, it was an easy decision when Cathy Sterba agreed to move with her husband to the sunshine state to escape the endless cold. There, Cathy has worked in the banking industry around Orlando for more than 30 years, starting as a management trainee at Barnett Bank, and now working as the CRA Officer, Fair Lending Officer, and Strategic Risk Officer for Seaside National Bank & Trust. Cathy not only graduated from Wake Forest University with a BS in mathematical economics, but she met her husband there as well. They have been married for over 30 years and have two grown sons. The two make a conscious effort to visit college friends at least once a year with a trip to Winston-Salem for fun or, in the fall, to get a little taste of cold weather and football. Cathy loves to travel and loves the excitement that comes with planning their next trip. She is also very active and will find any excuse to be outside, whether it be golfing, biking, gardening, or simply walking to the neighborhood Starbucks. 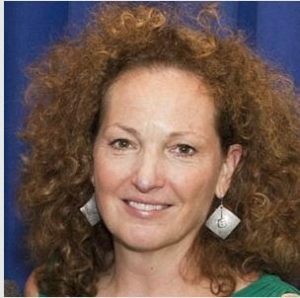 Aside from her work within the banking industry, Cathy is a founding and current board member of A Gift For Teaching (AGFT). AGFT was founded in 1998, and its mission is to provide free school supplies to teachers that serve in schools around the Orlando area. AGFT accepts donations so they can provide basic supplies such as pencils, paper and notebooks, and they also even recycle items such as laptops, keyboards, and other computer equipment and electronics. When her two children were younger, Cathy continued to stay involved and served on numerous school board committees including the School Advisory Council (SAC) and the Parent-Teacher Association (PTA). She also partnered with Healthy Central Florida (HCF), where they are working to transform their community into the healthiest in the nation by promoting individuals to get moving more, and to simply enjoy a more lively, energized lifestyle. Cathy doesn’t plan on slowing down anytime soon – she joined the AAA Scholarship Foundation in 2017 and serves as a very important role on the Bank Advisory Board. Cathy is ecstatic to work with a group of people that all have the same goal – helping children receive educational opportunity. It’s safe to say the world could use more people like Cathy! Click here for a pdf of this blog post. Mary Usategui has always gone the extra mile. Whether it be with her career, education or being the voice for those in need, she has never shied away from an opportunity to better herself or her community. With extensive experience in both the banking industry and non-profit realm, Mary Usategui has, and will continue to, change the lives of those around her. Mary is a Certified Public Accountant in the State of Florida and holds two master’s degrees – one in accounting from the University of Miami and the other in finance from Florida International University. She began her career in the banking industry at 18-years-old, where she first served as a bank teller. She then went on to work at the Coconut Grove Bank for over seven years and took on various roles that eventually landed her the position of Senior Financial Officer. 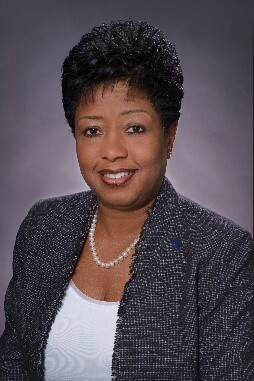 Now, Mary is the Executive Vice President & Chief Financial Officer at Professional Bank where she is responsible for the oversight of finance, accounting, banking operations and human resources. Aside from her career, Mary has always had a passion for wanting to help those less-privileged. This devotion led her to the AAA Scholarship Foundation where she is now a Bank Advisory Board Member, and has been for over two years. Along with these responsibilities, she assists and mentors young individuals within her community and is adamant about teaching them the importance, and value, of an education. Mary has a love for helping not only people, but animals as well. It had gotten to the point where Mary felt obligated to take in every stray dog she found, and at dog number four, her husband asked her to stop. Mary then became involved with the Everglades Angels Dog Rescue. This organization is an all-volunteer non-profit that puts every dollar earned towards vetting, boarding, feeding and other direct expenses for the benefit of the dogs they rescue. If Mary is ever late to anything, her co-workers won’t even blink an eye. Nine out of ten times she is helping a stray dog find its home, or convincing her husband that adding one more dog to the family is doable. Join AAA Scholarship Foundation for our upcoming informational meetings for the parents of potential 2018-19 income-based scholarship recipients. Parents will receive information about our scholarships, a paper application, tips & tricks on how best to complete the application and a raffle ticket to participate in a free raffle. All meetings will include both English and Spanish sessions. Adults only, please – no child care will be provided. Include your name, meeting date, number attending (maximum 2 people per household) and contact information. Once your RSVP is received, our staff will call or email you to provide the address of the meeting. The folks over at American Federation for Children, EdChoice and ExcelinEd have put together a memo to answer questions on how the 2017 tax law changes have provided families the opportunity to use their children’s 529 Savings Plans to help pay for qualifying k-12 education expenses. Not all expenses qualify and not all states participate so it’s important to talk to your tax adviser to be sure you understand the law before making any decisions. We hope this information is helpful! Click here to access a pdf of the memo. GA: Upon request, AAA will send you a full and fair description of this charitable program and a financial statement which shall be consistent with the financial statement required to be filed with the Secretary of State pursuant to Code Section 43-17-5. O.C.G.A. § 43-17-8. AZ: A school tuition organization cannot award, restrict or reserve scholarships solely on the basis of a donor's recommendation. A taxpayer may not claim a tax credit if the taxpayer agrees to swap donations with another taxpayer to benefit either taxpayer's own dependent. FL: A COPY OF THE OFFICIAL REGISTRATION AND FINANCIAL INFORMATION MAY BE OBTAINED FROM THE DIVISION OF CONSUMER SERVICES BY CALLING TOLL-FREE 1-800-HELP-FLA OR ONLINE AT www.FloridaConsumerHelp.com, REGISTRATION DOES NOT IMPLY ENDORSEMENT, APPROVAL, OR RECOMMENDATION BY THE STATE. FL REGISTRATION #CH38386 NV: A contribution or donation to AAA Scholarship Foundation, Inc. may be tax deductible for federal income tax purposes.